NEW : outdoor salt-water POOL with beautiful views from JUIN 2012. LE CLOS ST. JULIEN is a 16th century Manor House entirely restaured with state of the art comfort by a leading architecte. Beautiful views over the Dordogne valley and to th medieval castles. Very charming and cozy , beautiful antic furniture in a very comfortable setting. Luxurious features, beautiful outdoor salt water pool and big JACUZZI in a beautifully restaured barn with breathtaking views. The house is fully airconditionned and we offer you free Wireless Highspeed Internet. 3 spacious bedrooms with King Size beds and 3 En-Suite bathrooms with italian walk in showers. prehistoric caves , medieval castles, canoe on the Dordogne, typical local markets every day in another village and in SARLAT. Hiking trails in front of the Manor House. relax in our new salt-water pool with breathtaking views tover the castle of CASTELNAUD and LES JARDINS DE MARQUEYSSAC. We are living in Grasse at the French Riviera, GAbriele is the owner of a B&B called LE MAS DU ROC and Olivier is working for Paramount Pictures. We have 2 adult kids and 3 adorable doggies. If you are looking for relaxation in a refined and comfortable place near the medieval villages and castles and want to know about history and the prehistoric caves, LE CLOS ST. JULIEN is waiting for your visit. 3 En-Suite bathrooms with italian walk in showers. Luxurious features. Relax in our new outdoor salt-water pool with fantastic views from JUIN 2012 . A big JACUZZI is situated in the fully restaured barn with 360 ° glass window and view to the Dordogne valley. My husband, adult son and his girlfriend spent a glorious week in Perigord Noir. The manor house was large plenty of privacy and exceptionally quiet. Lovely kitchen, dining area, nice bedrooms and baths. There is nothing like the birdsong of rural France. Centrally located for the magnificent sites of Dordogne and Vezere valleys. I’d return in a heartbeat. We really appreciated your wonderful review and we are very pleased that you enjoyed so much our house and the beautiful region of the Dordogne. You are always welcome on your next stay. If I had never left the house and surrounding countryside the experience of the Dordogne, for myself and my family, would have been complete. For a week we shopped in the local markets and ate all of our meals but one around the wonderful kitchen table or in the garden, built a fire in the beautiful fireplace and played board games, we walked to nearby villages through fields of wildflowers and orchards of walnuts, explored along the river, visited castles and caves, canoed along the Dordogne. It was amazing for all of us (4 adults, a 10 year old and a 7 year old). I wish it was mine and I could have stayed there. We stayed (4/5 people) at Clos St Julien for two weeks and would stay again---that's the ultimate test. The house is located in a small hamlet about 2 miles from Cenac, so it has a wonderful rural setting, quiet, with very nice walking opportunities to the Dordogne river nearby and across walnut groves. Well-furnished, comfortable, and more like a friend's house than a vacation rental. Gabriele (Owner) is very responsive and professional. This was out second stay at the Manor house and we had another great two weeks. The house is around 16th century with lovely high ceilings and each room has great character. It has a stunning open spiral staircase up into the lounge and bedrooms which might be difficult for small children and the upper bedrooms had restricted headroom due to the loft but they were beautiful rooms full of character and the en-suite facilities were also modern and efficient. The pool and Jacuzzi are beautifully kept and the pool and sunbathing area also has sufficient shade for when the sun was too much! The house had very efficient and quiet air conditioning for all the rooms but the walls were so think anyway the house generally was quite cool. Good quality kitchen and TV equipment plus effective WiFi. The house and garden was beautifully clean on arrival. The garden and pool are was quite and not overlooked and allowed lovely views of the valley and the soaring Black Kites flying in groups overhead with their piercing calls. We had a wonderful week at this residence--a really beautiful house with much character. The house is furnished very tastefully in a traditional manner but with all modern conveniences. It's location is great near to so many of the sites of Dordogna. The location is quiet with a wonderful view of a castle from the kitchen. It was too cold to use the outdoor pool but we did take advantage of the jacuzzi. The lower level with the kitchen is spacious. The second level has a large sitting area with TV (and a good supply of DVDs). Adjoining this is a bedroom with e suite bathroom. On the third floor are two more bedrooms with separate showers and a shared toilet. Overall this is a very comfortable place to vacation. For those looking for a supermarket there is one at the end of the Main Street in Cenac. I would definitely recommend this place and we found the owner to be very responsive to our concerns or questions. thanks very much for enjoying our beloved house in the Dordogne. Thanks for appreciating it and the so beautiful surroundings. I hope you will have a lot of amaizing memories and photos to share with your friends. This lovely manor house is nestled in the beautiful quiet countryside. The three levels of renovated house provides a comfortable, extremely roomy and unique vacation house. Gabriele was a great hostess by providing instructions, market information, and tips for a fun visit. The appliances are modern and everything was as listed in the description. We enjoyed sitting in the backyard and using the jacuzzi (the pool was ready but the weather was too cool to use it). There were many interesting and delightful adventures within 30 minutes driving distance. Members of our group enjoyed walks on the various trails almost every morning. A car is definitely needed to explore the area and have flexibility for market shopping and getting to and from the house. The kitchen, living room and one bedroom, and the other two bedrooms are on three levels with a stone winding staircase which gave our two couples private separate bedrooms and bathrooms. If you want a quiet vacation house in the countryside in a well maintained and fully equipped stone house, this is the one to pick! 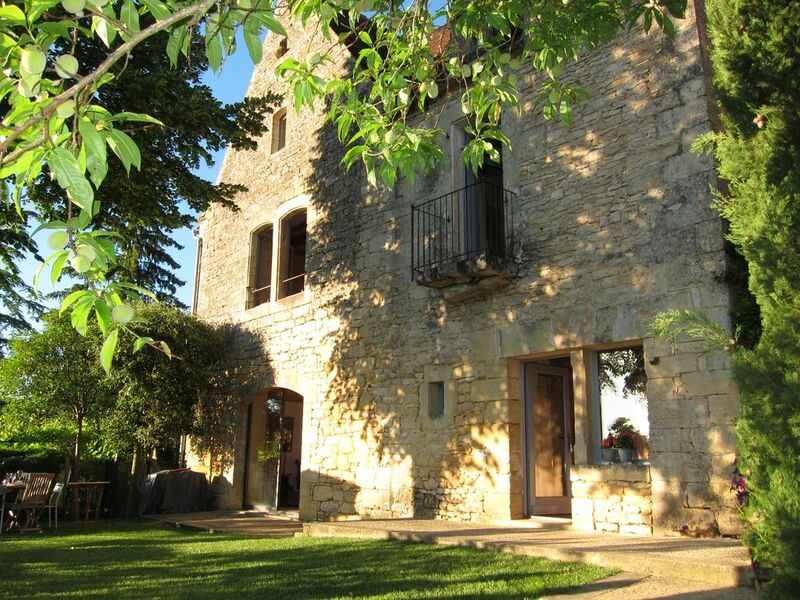 Situated in the the heart of the Dordogne valley in th golden Triangle of the Perigord Noir. Nearby you will find medieval castles and prehistoric caves. The situation of the Manor House allows you to visit all these amazing placees in no time and various hiking trails start right off the house. Fine Dordogne river beaches are within 5 miutes walk. This place is a combinaison of relaxing, sightseeing and enjoying gourmet food. A concentration of peace and refinement. Inclus dans le prix : Internet ,elctricité, eau, chauffage, airconditionné, taxes de séjours, Piscine, Jacuzzi, draps et serviettes de toilette, serviettes de piscine.